“Let Her Go” feels like back-to-basics The Vampire Diaries, in all the best ways. While the lead-up to Sheriff Forbes’ death was perhaps one of the most disappointing story arcs of the season, the aftermath hits all of the right notes—from sad to sweet, from angry to scary—and the result is one of the best episodes of the season so far. For an episode that could have just been all about Caroline’s grief and that probably would have been enough, this one had a lot of moving parts. There was the funeral and the inevitable Caroline fallout from the funeral, Kai and Jo almost dying, Alaric and Jo’s big news, Bonnie’s return, and there was still room for plenty of Damon and Stefan flashbacks to set up what looks to be an interesting new twist in the Salvatore family story. Despite being stuffed to the gills it almost all works, mostly because episode writer (and first-time director) Julie Plec deftly uses emotion and character to keep everything firmly grounded. The biggest story of the episode is obviously Caroline’s struggle to say goodbye to her mother, and as much as I complained about the lack of face time between Caroline and Liz these last few weeks, the show really nailed Caroline’s emotional journey here. She starts off the hour devastated, barely able to even tolerate being in the same airspace as Damon. But once Damon tells her that from his own experience in losing his mother, the pain only gets worse (which, thanks a lot Damon, very helpful) her attitude immediately changes. It isn’t so obvious at first—she basically turns back into the Caroline of her mother pre-death, the one obsessed with getting all the details in order—but eventually Elena realizes exactly why Caroline seems so calm. She’s calm because she doesn’t plan on grieving much at all; as soon as the funeral is over, she’s going to flip her humanity switch and avoid the pain altogether. The humanity switch has never been my favorite part of the vampire mythology on this show, but at least this decision makes a bit of internal sense for Caroline’s character. She’s spent the majority of the time since her mother’s diagnosis doing everything possible to avoid the reality of her impending death, so now that she’s gone why wouldn’t she avoid the pain? That she does it by allowing Elena to wholeheartedly beg her not to, right before coldly snapping her neck, is exactly the right way to kick off this story. All I hope is that Caroline’s humanity-free journey is at least distinct from all the others that have come before her. 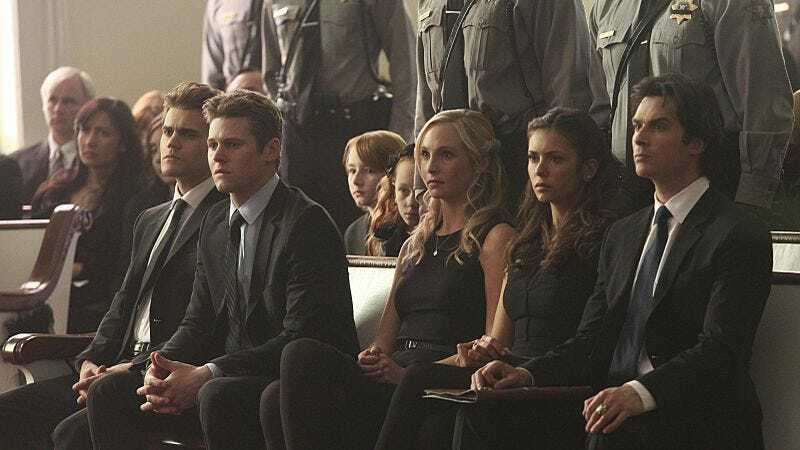 Another redeeming factor of Caroline’s story was the funeral itself, which allowed the show to finally have scenes of these characters acting like an actual group of friends who care for each other and come together to help each other. These are scenes that have sadly become few and far between as the show has progressed, as the action gets spread between little pockets of friends rather than affecting the whole group at once. It’s nice to see them together, even if it is at a funeral. And what a funeral it was—complete with a surprisingly emotional last police radio call and a lovely song from Candice Accola—capped by the eulogy Damon promised Liz, a eulogy he regretted never giving his mother. It’s this eulogy storyline that kicks off a set of flashbacks to Stefan and Damon at the time of their mother’s funeral, and all of the mentions of Mama Salvatore in the last few weeks definitely were a tipoff that something was up. One of the best things about supernatural shows is that if you leave any sort of story opening, particularly when it involves a character death, you can use all of your supernatural freedoms to later go back and use that opening to your advantage. Stefan and Damon’s mother has never been a big part of the mythology—all we know from their past is about their father. By suddenly bringing her into the narrative, something was obviously going to happen to bring her back into the show’s fold. It’s how they brought her back that ended up being so fun. It’s no secret that ever since I started covering this show again, getting Bonnie back to Mystic Falls is something I’ve been impatiently waiting for. I didn’t much care how it happened, as long as Bonnie was somewhat responsible for saving herself. That’s exactly what happens here, as Kai and Jo must do a spell to give him her magic in order to prevent the entire Gemini Coven from dying, and Bonnie takes advantage of their spell to hitch a ride back to Mystic Falls. The Kai and Jo part is fairly uninteresting, other than the revelation that there isn’t just one prison world out there, there are hundreds of prison worlds each holding their own very bad guys and girls. Bonnie discovers this when she tries to get back to present day Mystic Falls and ends up in 1903 Mystic Falls, where she finds a diary written in a woman’s handwriting and sees pictures of young Stefan and Damon. It’s when she finally makes her way back to the present day that she runs into the woman who wrote the diary, and it’s none other than Mama Salvatore. It’s a great plot development, reminiscent of those classic TVD twists, especially because you know she’s probably going to get up to no good. Bring on the twisted mother games. I thought Julie Plec did an absolutely fantastic job directing this episode. Standout moments: the whole funeral sequence and the neat transition from Caroline and Elena in the present to Bonnie in the past. Now I want to see her direct an episode of The Originals. The opening flashback was a bit too on the nose for me, but in an episode about a character’s mother’s death, I suppose you can get away with some manipulative emotional sap. My happiest surprise about this episode was how great Elena was written. She supported Caroline without reservation, didn’t blink twice when Caroline talked to her about Stefan, and generally just felt like the caring Elena Gilbert of the pre-vampire days. I hope this Elena sticks around for a while. A few things about Caroline and Stefan: Did Stefan really basically imply that true love was only possible with Elena Gilbert for both Salvatore brothers? Also, what does everyone think about Stefan having a revelation about his feelings for Caroline at Liz’s funeral? I can’t figure out how to parse this relationship, myself, but I’m curious to see how he reacts to Caroline’s decision to turn off her humanity. What is the age difference between Stefan and Damon supposed to be? Because using a 10-year-old version of Stefan in a scene with Ian Somerhalder was confusing, to say the least. 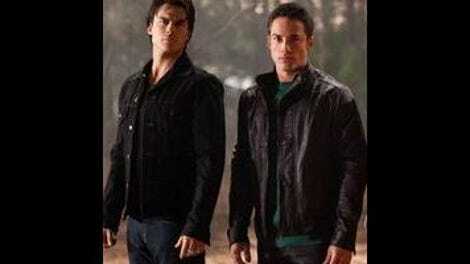 Somerhalder can’t quite pass for a teen, even with the strongest available blurry filter.